Sheep rams taken in Units 7, 9, 11-16, 19, 20 and 24 and sheep rams with horn restrictions in Units 23, 25, and 26 must be sealed. It is illegal to transport sheep horns outside the state before sealing. 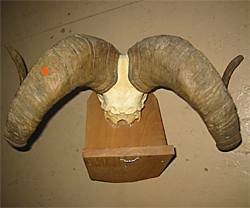 When hunters bring a legal sheep to ADFG offices, horns will be sealed by inserting an aluminum Foundation for North American Wild Sheep (FNAWS) plug into the horn. 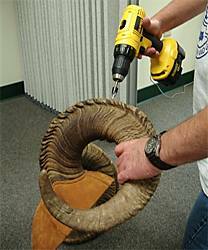 By adopting use of the aluminum FNAWS plug in 2006, ADFG will seal sheep horns using the same method as all other agencies managing wild sheep in North America. The FNAWS plug is one inch long and shaped like a nail, with a flat head 1/2 inch in diameter and 1/8 inch thick, and a shank 7/8 inch long and 7/32 inch in diameter. It will be inserted into the horn by drilling a 1-inch deep hole with a countersink, so the head of the plug will be flush or slightly below the surface of the horn. The FNAWS plug will be inserted into the hole by tapping it into place with a rubber mallet. The FNAWS plug will be placed into the sheep's left horn, at approximately the 2:00 position when viewed from the animals left side. Hunters and ADFG staff have some latitude to select the specific location for the plug, but it should not be placed into the bony core of the horn. The FNAWS plug is placed in the horn permanently or until the horns are permanently removed from the skull plate. Each plug has an individual identification number. 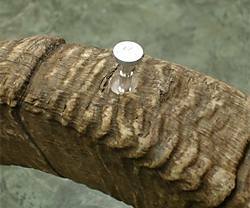 A small hole is drilled in the left horn several inches up from the base above the bony core of the horn. A numbered aluminum plug is tapped into place with a mallet. The plug must remain in the horn permanently or until the horn is removed from the skull plate.